There is a sandbar between two Florida islands that sinks beneath the warm Gulf waters, only to reappear decades later during tropical storms and hurricanes. To locals, this mysterious passage is a shortcut between the Bay and Gulf when open, and a beautiful private beach when the sands rise again. For the Calusa Indians, it is a spiritual passage between the worlds. Their 10,000 year reign over South Florida comes to an end, and the tribe sinks into the closing waters. It will be centuries with Midnight Pass opening and closing after Hurakan's storms, before the Calusa's return to help Kali and her followers prepare to win a battle after the gods rage storms of apocalyptic proportion. Kali and her twin brother Tommy, were raised on Siesta Key. When they were twelve, Tommy took their fishing skiff for a short excursion out of the inlet and into the Bay. He never returned. Over the years, Kali discovers that she shares unusual beliefs with her Aunt. Noreen guides Kali's visions of a strange Indian tribe that will help them survive the destructive apocalyptic war. Strange events surround the two women, as the Shaman and Jatung, the Calusa chief, share their wisdom. 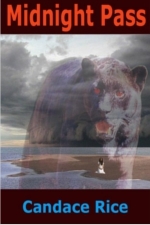 A panther god becomes a guardian for the women, as their determination and strong beliefs help Kali and her friends re-build life on Siesta Key after the storms and tidal waves leave them isolated. The strange coven from Estero become experts at fishing, Cinda and the healers from Manatee plant gardens, and Arnell and her group of warriors, build canoes and weapons. Meanwhile, Brad and Lucayo are busy on the mainland, organizing their forces in Myakka. They are equally as determined to defeat the women in the final battle on the shores of Midnight Pass. Kali and Noreen dressed in green shaded sarongs, and walked the beach to Point of Rocks. Kali inhaled the fresh sea air, praising the god Ih P’en and goddesses Ix Kanan for their fertility and guardianship over growing things. Whenever she thought of the strange consort of gods and goddesses, she felt closeness with everything surrounding her. threaded through the eye sockets. Their Sabbat ceremony that night included the crystal skull, centered on the altar. Kali had been sharing Noreen’s visions for decades, and the two of them were surprised when the Chief and Shaman were both looking at them with their arms spread. Jonathan and Tommy rose to their feet, and slowly more of the tribe joined them until everyone was standing. When the cakes and wine had been spilled to the earth in offering to the goddess and the four quarters closed so that their circle was broken, Noreen finally whispered, “Oh dear god.” She silently picked up the skull and locked it in the safe embedded in the yellow tile floor in her bathroom. Kali already had two glasses of the elderberry wine that Noreen had made last fall for their Mabon Sabbat, sitting on the table in front of the fireplace. “How many?” Kali asked nervously. “Did you see the shadow behind them?” Kali was nervously picking through the end of her braid with the hand not holding the wine glass. They did. The next morning seven older women pulled into the driveway, arriving in a conversion van with a bumper sticker proudly announcing that others should ‘Play nice on the Road… My other car is a Broom’. They piled out of the van in matching pink tee-shirts, with a winking happy face wearing a black pointed witch hat. At first, a few of them looked nervous, as if they were afraid they would be turned away if they hinted at the nonsense vision they had had during their coven ceremony the night before. They were slightly calmed by the sighting of Noreen’s totems, and were quickly put at ease with a welcoming ritual of wine and homemade bread. Cinda was their unofficial leader, and owner of the ark… the name they had christened the van. For the past thirty years they had come together, moving into Cinda’s farmhouse in eastern Manatee County. Two of the women remembered several of Noreen’s family from their youth, when they hung around the handsome tanned fishermen on the docks. Eventually the village was busted, and the women learned they could have visions without the ready supply of marijuana. All of them had been drawn to Cinda, who had a non-sanctioned holistic medical practice on the outskirts of town. She never advertised, guaranteed, or used any illegal herbs, so the county left the eccentric alone. Word of mouth kept her healing business thriving, and as the household grew they added a tarot card reader, one who healed with crystals, a numerologist, a horoscope expert with an extensive astrological background, a palm reader and a runes practitioner… all under one roof. Kali and Noreen were amazed that the women seemed to blend their talents together, confirming one another’s visions instead of trying to overshadow them with their specialty. Their mystical practices supplied income, but they also had gardens and sold vegetables and fruit at a canopied stand at the end of the driveway. That, and eggs from free range chickens, kept them well-funded. Next to arrive was Mandi, thundering up the driveway on a huge black motorcycle she had named ‘Chopper’. For all the black leather and henna tattoos… Mandi refused to paint herself permanently because the designs in her visions constantly changed… she was rather soft spoken. Still, when the five other solitary gothic-garbed women arrived, they formed their friendships around Mandi. Their group consisted of an assortment of talent, basically centered on natural foods from plants that grew in the wild. They brought back nuts and fruits from trees on the property that Noreen and Kali had been unaware of. The largest group to arrive pulled up in two station wagons. It was a coven of fifteen that had been drawn together over the years, and they lived in various spots from the Everglades to the west coast. They were primarily mapmakers and geologists, and at night they would study scrolls of where the old Indian mounds and canals used to be located. They had diverse knowledge in anything concerning the makeup of rock and shell, and they knew where to locate the finds. They did not seem to have a distinguishing leader, and maintained a close camaraderie of spending time sharing their studies. The group of eight from Naples were historians, focused on ancient religions. The others constantly badgered them for information on the tribe in the visions. It was then that they learned the Indians were Calusa, and extinct for two hundred and fifty years. There was precious little the women could tell them, as the Calusa had left few records. They had melded the studies with the Mayan after agreeing that they shared origins. As the original tribe split off, with small factions forming the descendants of Native American Tribes and the mound builders such as the Cahokia in Illinois and throughout different aspects of North America, a small true bloodline of Calos had traveled to Florida. The Naples coven became a favorite of everyone, though they had no apparent physical skills. Their manic research had kept them bent over books and computers, absorbing the religious wisdom of the ages. Next was the strange group of nine from Estero. The women only mixed lightly with the rest, and spent virtually all of their waking moment on the dock or at the beach. They obviously were attuned to the water, and Noreen gradually drew out that the women had been holding their ceremonies on Jatung’s temple mound. They were uncomfortable, because their visions had led them to perform their rituals to an underworld god of fishing, and they were afraid they were being set up to somehow destroy the group. Kali and Noreen reasoned with them that because they had shared their concern it was not likely to be the case. The rest of the group agreed, but no one was ever able to get really close. The Estero coven remained aloof, quietly studying the water, and only sometimes asking questions of the historians from Naples. Last to arrive was Arnell, chugging up the driveway with her two young friends in a sedan that coughed its last breath when she turned off the engine. Arnell climbed out, red ponytails flashing copper in the sun, turned and pointed her finger at the car and symbolically shot it. It would be a while before the three youngest shared their specialty… they were the warriors. When the weather warmed enough at night, tents were set up in the backyard to relieve the cramping in the house. Ceremonies and protective spells were being held all over the property, and when their clan grew to fifty, the power of the Midnight Pass estate was palpable. The women made regular trips to the quartz beach, and nine who came from near Estero had been encouraged enough by the rest of the clan to accept their role to devote their rituals to Chak Uayab Xoc in hopes that they would be spared if the battle raged towards the sea. Their concern about their placement in the clan relaxed, and they allowed themselves to feel empowered with their rituals honoring the sea god. With the Naples coven support, and Kali and Noreen behind them, their compulsion to praise and acknowledge Chak Uayab Xoc began to make sense, as they needed a faction of their clan to try to offset the nine tyrants of the underworld. They were extremely hopeful that their offerings would help to balance things. At the Beltane Sabbat on May first, the group knew that their number had stopped at the fifty. Kali was uncomfortable with the almost reverent treatment she received, and someone was always handing her a glass of iced chamomile tea to calm her. Noreen thrived on all the activity… until the vision that evening.